President Herbert Hoover was inagurated March 4, 1933, Washington DC. Here you see the chart set for noon (exact time unknown.) Noon that day was during a Venus Hour, Venus 27Ari30 in 11th house. Moon is chart-ruler 27Sag05, 6th house, conj Saturn…depressive. The feature that jumps out is the Kite pattern with Mars, the Ascendant, and Venus-Neptune midpoint at the tip, and the Moon-Saturn conjunction as the tail. This Solar Eclipse occurred Nov 12, 1928 in the 2 South Series – the PE of the first term of George W. Bush. Brady’s ‘Predictive Astrology’ gives the 2S Series as being concerned with unusual groups and the individual’s involvement in such groups; there is a sudden desire to join a particular group – healing, the arts, or love of humanity – and one feels that through this involvement he or she will gain a great deal. Asteroid Pallas (strategy) is conj Midheaven along with America’s natal Ceres (security issues) and Pluto/Chiron midpoint. 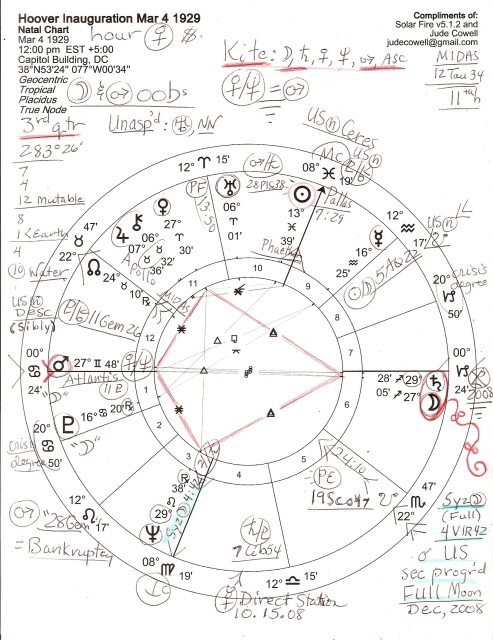 The plutocratic, oppressive Pluto/Chiron midpoint in 1929 is at 11Gem26 (12th house of this chart) which is conj the Descendant in America’s natal chart (Sibly version) suggesting a powerful group’s interference or opposition. As you know, US presidential inaugurations were once held on March 4 giving ‘the leader’ – the Sun – a 13Pis+ position, with 00Can+ rising, a World Point. The switch to Jan 20 occurred with FDR in 1937, for his second inauguration. His first was held March 4, 1933.